Providing that no special requirements are specified in below Table and that additional requirements for specific classes of ships (in accordance with SOLAS chapters V and X) are met. The radar installation, in addition to meeting the general requirements as set out in resolution A.694(17)*, should comply with the following performance standards. Close interaction between different navigational equipment and systems, makes it essential to consider these standards in association with other relevant IMO standards. With own ship at zero speed, an antenna height of 15 m above the sea level and in calm conditions, the navigational buoy in Table should be detected at a minimum horizontal range of 40 m from the antenna position and up to a range of 1 NM, without changing the setting of control functions other than the range scale selector. The radar system should be capable of displaying two point targets on the same bearing, separated by 40 m in range, as two distinct objects. The target detection performance of the equipment should not be substantially impaired when own ship is rolling or pitching upto +/-10°. Means should be available to ensure that the radar system is operating at the best performance. Where applicable to the radar technology, manual tuning should be provided and additionally, automatic tuning may be provided. An indication should be provided, in the absence of targets, to ensure that the system is operating at the optimum performance. Means should be available (automatically or by manual operation) and while the equipment is operational, to determine a significant drop in system performance relative to a calibrated standard established at the time of installation. The radar equipment should be fully operational (RUN status) within 4 minutes after switch ON from cold. A STANDBY condition should be provided, in which there is no operational radar transmission. The radar should be fully operational within 5 sec from the standby condition. Range scales of 0.25, 0.5, 0.75, 1.5, 3, 6, 12 and 24 NM should be provided. Additional range scales are permitted outside the mandatory set. Low metric range scales may be offered in addition to the mandatory set. The range scale selected should be permanently indicated. An appropriate number of equally spaced range rings should be provided for the range scale selected. When displayed, the range ring scale should be indicated. The system accuracy of fixed range rings should be within 1% of the maximum range of the range scale in use or 30 m, whichever is the greater distance. At least two variable range markers (VRMs) should be provided. Each active VRM should have a numerical readout and have a resolution compatible with the range scale in use. The VRMs should enable the user to measure the range of an object within the operational display area with a maximum system error of 1% of the range scale in use or 30 m, whichever is the greater distance. At least two electronic bearing lines (EBLs) should be provided to measure the bearing of any point object within the operational display area, with a maximum system error of 1° at the periphery of the display. The EBLs should be capable of measurement relative to the ships heading and relative to true north. There should be a clear indication of the bearing reference (i.e. true or relative). It should be possible to move the EBL origin from the consistent common reference point to any point within the operational display area and to reset the EBL to the consistent common reference point by a fast and simple action. It should be possible to fix the EBL origin or to move the EBL origin at the velocity of own ship. Means should be provided to ensure that the user is able to position the EBL smoothly in either direction, with an incremental adjustment adequate to maintain the system measurement accuracy requirements. Each active EBL should have a numerical readout with a resolution adequate to maintain the system measurement accuracy requirements. A True Motion display mode should be provided. The automatic reset of own ship may be initiated by its position on the display, or time related, or both. Where the reset is selected to occur at least on every scan or equivalent, this should be equivalent to True Motion with a fixed origin (in practice equivalent to the previous relative motion mode). North Up and Course Up orientation modes should be provided. Head Up may be provided when the display mode is equivalent to True Motion with a fixed origin (in practice equivalent to the previous relative motion Head Up mode). 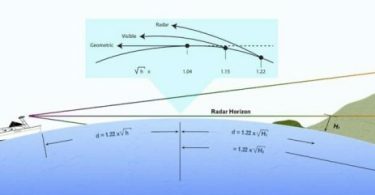 What factors affect the Radar Horizon?